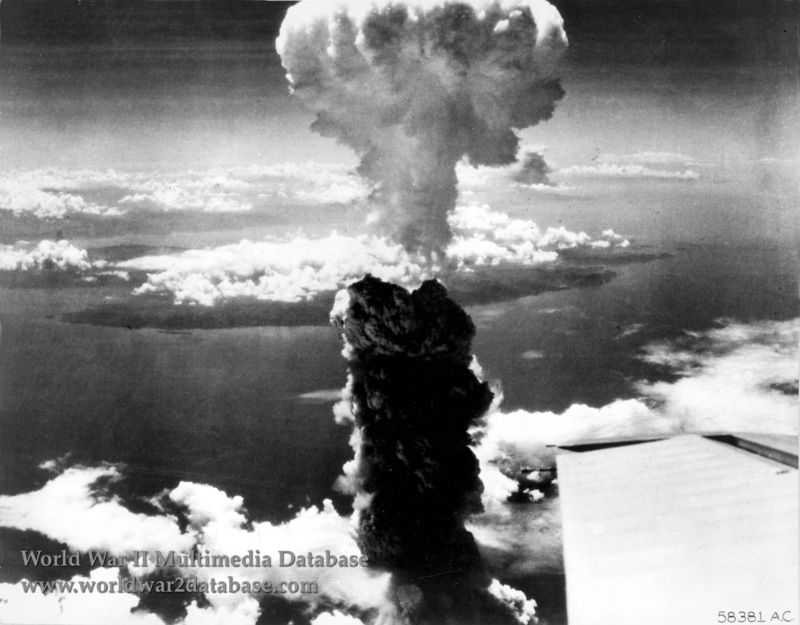 Nagasaki mushroom cloud photographed from "Big Stink" B-29 Superfortress (B-29-40-MO 44-27354, victor number 90). You can see part of the wing in the lower left corner. Assigned to the 393rd Bomb Squadron, 509th Composite Group, it was used as a camera plane in support of the bomb-carrying Bockscar, to photograph the explosion and effects of the bomb, and also to carry scientific observers. It carried a high speed camera but the Project Alberta operator forgot his parachute and was left behind. The crew received radio instructions for its operation. The mission was flown by crew C-14 but with Group Operations Officer Major James I. Hopkins, Jr., as the aircraft commander. The aircraft failed to make its rendezvous with the remainder of the strike flight, which completed the mission without it. It did however arrive at Nagasaki in time to photograph the effects of the blast, then recovered at Yontan Airfield, Okinawa with the other 509th Composite Group aircraft.